Here's the 2016 Ford Explorer in its cop costume, otherwise known as a "Ford Police Interceptor Utility." Upgrades on the civilian version go a little deeper than those LEDs, but I bet you'll still be able to outrun these suckers. Kidding, please do not do that. 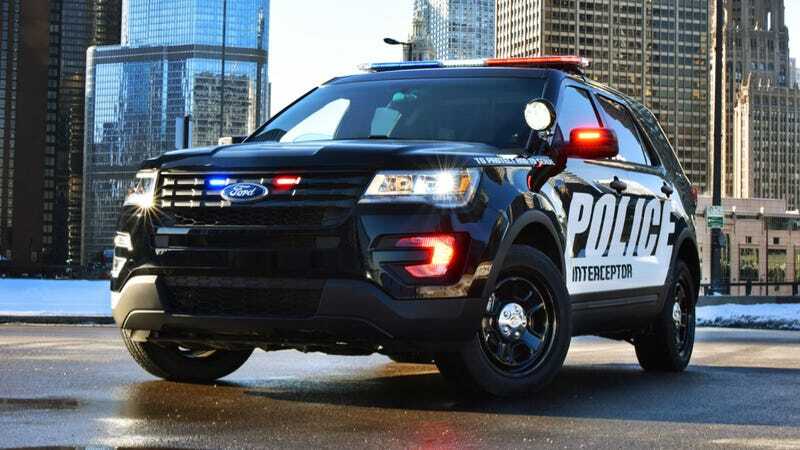 Cops started using the Explorer-based Interceptor Utility in 2012, and since then it's sucked up more than half of America's law enforcement vehicle market. Obviously Ford wants to keep that momentum going, so they've called upon their own Police Advisory Board "to refine and develop future products that meet the needs of law enforcement agencies." Ford has actually been running this program since 2000. It's basically made up of a rotating panel of 25 "experts from the law enforcement community" who advise the company on what cops need in vehicles and help evaluate prototypes. "Pursuit Mode" for the six-speed automatic transmission. Ford says this "optimizes upshifts and downshifts for aggressive driving," so it's probably a bit like "Sport Mode" on any other car. The software is "tuned to perform a reverse J-turn, which is when a reversing vehicle is spun 180 degrees and continues, face forward, without changing direction of travel." Try that in yo mama's Explorer! What, you did? Well... I'm telling! "Surveillance Mode" which rolls up the driver's window and locks the doors when someone approaches the rear of the vehicle. Enhanced electrical system that distribute electrical loads more efficiently. Tailgate release reachable from the front seat. Ford says "It allows the rear liftgate mechanism to remain unlocked for 45 seconds before timing out, permitting officers to access the cargo area." Not sure why the police would need that, but okay. Beefier cooling system to accommodate long idle times. Special brakes "designed to withstand excessive use." 18" steel wheels are supposed to have high venting characteristics to help cool the brakes. The cop Explorer ships with Ford's new base V6, the 3.7 liter naturally aspirated engine with 304 horsepower and 279 lb.-ft. of torque. Ambitious agencies can also order the 3.5 EcoBoost with 365 horsepower and 350 lb.-ft. of torque. We'll take a closer look when we see it in person in Chicago.